Install home sprinklers correctly -- and save lives -- with the updated edition of NFPA 13D. Automatic sprinklers help reduce the risk of dying in a home fire by about 80% while significantly protecting against property loss. 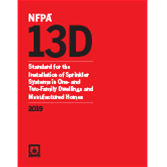 The 2019 edition of NFPA 13D, Standard for the Installation of Sprinkler Systems in One- and Two-Family Dwellings and Manufactured Homes, features up-to-date criteria addressing every aspect of sprinkler design, water supplies, equipment, and placement. Revisions in NFPA 13D address gaps in coverage and clarify requirements, so you can make homes safer from fire and related hazards. Interested in other editions of NFPA 13D? Use the drop down menu above to select the edition year you need. Live-Action home fire sprinkler video demo. This powerful home fire sprinkler system video illustrates how sprinklers save lives and reduce fire loss. Watch a room without fire sprinklers reach full flashover in less than 1 minute and 30 seconds, compared to a room with sprinkler protection, where the fire is quickly contained. 5.2 Aboveground Pipe and Equipment. 5.3 Water Supply Pipe and Fittings. 6.4 Manufactured Home Water Supply. 7.2 Drains and Test Connections. 9.3 Dry Pipe and Preaction Systems. 10.2 Number of Design Sprinklers. Use NFPA 13D to design and install reliable and economical sprinkler systems that keep people and property safer from fires in the home. Research shows that residential fire sprinklers could take monumental strides in saving lives and reducing property loss in homes, where most fire deaths in the U.S. occur. NFPA 13D, Standard for the Installation of Sprinkler Systems in One- and Two-Family Dwellings and Manufactured Homes is the solution to correct residential system design and installation. Coverage includes water supplies, equipment requirements, as well as sprinkler location, spacing and position. Safety experts, fire fighters, and community leaders strongly advocate installing sprinklers in dwellings, and sprinkler systems are a requirement in all U.S. model building codes. Each edition of NFPA 13D incorporates new information about saving lives, protecting property, and watching your bottom line. The 2016 NFPA 13D, Standard for the Installation of Sprinkler Systems in One- and Two-Family Dwellings and Manufactured Homes adds clarification on the re-use of sprinklers; a new figure addressing the positioning of sprinklers to avoid obstruction where there are sloped ceilings; as well as a new sketch showing an insulation practice using tenting in an attic or concealed space. The 2016 NFPA 13D also includes the latest information about antifreeze use. The 2013 edition of NFPA 13D, Standard for the Installation of Sprinkler Systems in One- and Two-Family Dwellings and Manufactured Homes helps improve cost-effectiveness in residential sprinkler design. A major change allows a four-head calc that can eliminate conflicts in determining sprinkler coverage for sloped and beam ceilings. New provisions allow the use of backflow preventer for shutoff, and new information on "shadow area" helps you avoid ceiling fan blockage. This edition also includes an update on antifreeze use. The 2010 edition of NFPA 13D, Standard for the Installation of Sprinkler Systems in One- and Two-Family Dwellings and Manufactured Homes features an expanded scope covering system inspection, testing, and maintenance. It also introduces an 8-step prescriptive pipe sizing method as an alternative to the hydraulic calculation method, to improve flexibility in design. This edition clarifies that "townhouses" can be protected by an NFPA 13D. A new annex provides key maintenance and testing information for homeowners. The 2007 edition of NFPA 13D, Standard for the Installation of Sprinkler Systems in One- and Two-Family Dwellings and Manufactured Homes adds spacing and obstruction rules addressing sloped ceilings, ceiling pockets, ceiling fans, and kitchen cabinets. New installation, design, and acceptance requirements for pumps help you ensure adequate water supplies when needed. Other new requirements address listed dry pipe residential sprinkler systems. This edition also clarifies the acceptability of insulation as a method of freeze protection. The 2002 edition of NFPA 13D, Standard for the Installation of Sprinkler Systems in One- and Two-Family Dwellings and Manufactured Homes introduces an improved format and a revised list of locations in dwellings where sprinklers can be omitted. Other major changes include new discharge requirements and updated network and mutipurpose system rules. The 1999 edition of NFPA 13D, Standard for the Installation of Sprinkler Systems in One- and Two-Family Dwellings and Manufactured Homes presents revised coverage on residential sprinkler system design considerations, water supplies, equipment requirements, and sprinkler location, spacing and position.